Versatile percussionist Shawn Mativetsky performs in a variety of musical genres with dynamism and skill. Equally at home in Indian classical music, world music, and contemporary/new music, Shawn also composes and performs for dance and theatre. 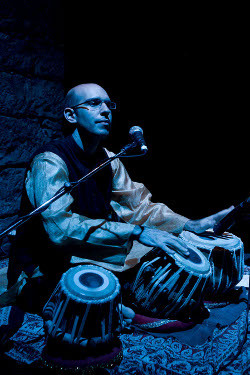 Exponent of the Benares gharana, and disciple of the legendary Pandit Sharda Sahai, Shawn Mativetsky is a highly sought-after tabla performer and educator. He is active in the promotion of the tabla and North Indian classical music through lectures, workshops, and performances across Canada and internationally. Based in Montreal, Shawn teaches tabla and percussion at McGill University. His solo CD, Payton MacDonald: Works for Tabla, was released in 2007, and Cycles, his new CD of Canadian compositions for tabla was released in the fall of 2011. As a practitioner of Indian classical music, Shawn regularly gives solo tabla performances, as well as accompanying kathak dance, voice, bansuri, sarod, santoor, sarangi, and sitar artists. Since 2003, Shawn has been affiliated with the Pandit Ram Sahai Foundation (UK/India), and in the summers of 2006 and 2008, hosted tabla maestro Pandit Sharda Sahai’s annual summer tabla workshop. In recent years, he has worked closely with kathak dancer Sudeshna Maulik for her performances of Crossroads, Mehfil, Soul of Ganges, and Hands and Feet. Shawn has performed numerous solo recitals, spanning Canada, the United States, England, and India and has been featured in series such as the Windsor Canadian Music Festival, New Music in New Spaces, Groundswell, Festival Montréal Baroque, Jusqu’aux Oreilles, Evolutions, Voyages: Montréal-New York, Festival International du Domaine Forget, New Works Calgary, Music Toronto, and the Percussive Arts Society International Convention. As an ensemble musician, Shawn Mativetsky performs regularly with violinist Parmela Attariwala’s cross-cultural Attar Project, the Indian-folk group Galitcha, and the Indo-fusion group Ragleela. Regular performances with Galitcha have led to concerts across Canada and the US, as well as tours to France and Tunisia, and the chance to play with guest musicians such as Pt. Vishwa Mohan Bhatt, Salil Bhatt, Harry Manx, and Yves Lambert. 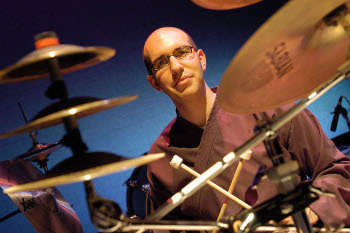 Shawn’s work as composer and percussionist in Geordie Theatre’s productions of Brahm and the Angel (2005) and Hansel and Gretel (2003) was met with critical acclaim. In 2003, he performed in Théâtre du Rideau Vert’s highly successful production of Paulo Coelho’s L’Alchimiste and was musical director and performer in Ensemble Mahapooram’s Le Lion du Panjshir and Danse Kalashas / Usine C’s dance production, En Himalaya. In 2006, he collaborated with the dancer Manijeh Ali, composing music for her solo dance choreography, Spirit of the Mountain. Shawn has also performed with Ramasutra, Matter of Time, Ensemble Kore, Ensemble Mont-Royal, Ensemble Mahapooram, Lithium Ensemble, the Montreal Organ Consort, and Duo Sheppard-Lanza, as well as with a number of symphony orchestras in Canada. His performances have been recorded for radio and television, including CBC, Radio Canada, Bravo, CH Montreal, and Zee Music (UK/India). In 2000, his recording with Ramasutra won an ADISQ Felix award, and was nominated for a Juno. 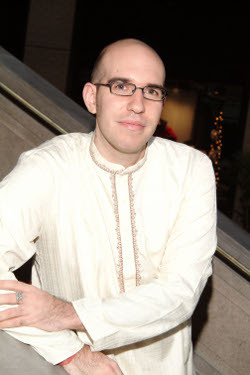 In addition to his tabla studies, Shawn Mativetsky studied Western classical percussion with Pierre Béluse, D’Arcy Gray, Andrei Malashenko, and Robert Slapcoff, and the percussion of Kathakali dance-theatre with Bruno Paquet. Shawn holds a Master’s degree in music from McGill University and has received grants from the Canada Council for the Arts, the Department of Canadian Heritage, and the Conseil des arts et des lettres du Québec. Shawn Mativetsky plays and endorses Sabian Cymbals.